Imagine that you are a major mobile phone manufacturer whose sales are on the slide and you are desperately in need of something to give you a boost. Perhaps you’ll carefully research the market, put together some focus groups and come out with the next-generation “must have” device which will transform your business. Or – as in the case of Motorola – you could simply go nuts. 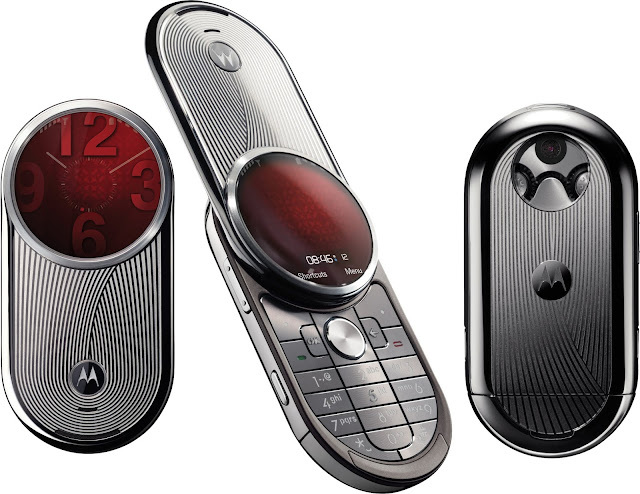 Launched at a very low ebb in Motorola’s fortunes, the Motorola AURA was absolutely not what the market was looking for, but still it managed to be a stunningly unique and extremely clever piece of engineering while still being utterly pointless. Perhaps the most remarkable aspect of the AURA was the circular screen. No, not a square screen with some parts masked off, but a perfectly circular 1.55” display with a diameter of 480 pixels covered by a sapphire crystal lens. Built around this extraordinary display was a metal Swiss-engineered rotating mechanism housing a phone that looked like nothing else that was on the market. Although it was utterly amazing to look at, the clever innovation didn’t extent to the phone itself. Underneath it was a pretty standard 2G feature phone with a few bells and whistles. Perhaps it’s just as well… browsing the web or watching a video on that circular screen would have been a challenge. However, a pretty decent 2GB of memory meant that the AURA was capable at music playback. The original R1 version was announced in October 2008 with a price tag of $2000. Various special editions followed over the next year including the “Celestial” edition to celebrate the 40th anniversary of the Apollo 11 moon landing and a Diamond edition with gold plating and diamonds around the screen, costing an eye-watering $5700. The AURA didn’t turn around Motorola’s fortunes, but it came during a period of relative inactivity as the company struggled to find a new direction (which it did a year later with its first Android phone). However, the AURA did become a collectable classic – and also a minefield for fakes – with prices starting at around £1000 and going up to £6000 and perhaps even more.